We are giving away a pair of tickets to Scott Pemberton Band @ The Goodfoot on April 20. To win, comment on this post why you’d like to attend. Winner will be drawn and emailed Friday, April 19. Join us for an evening with the Scott Pemberton Band! From his early goodfoot days leading the powerhouse organ trio, Triclops, to his long running curation of Sonic Forum Open Mic and into his former Tuesday residency with SP3, Scott has long brought funky good times and maestro quality string bending to the goodfoot. Tonight is a rare chance to see him in his natural habitat, as his jaw-dropping guitar skills have landed him bigger and bigger shows across the country. 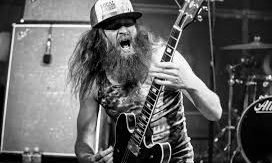 Scott is an emerging force on the festival circuit and with his wild approach to the guitar and nimble funky band he is immediately recognizable and undeniably original. He doesn’t use a strap, often plays the guitar like someone would play piano and performs with the uninhibited joy and intensity of someone who recognizes that every time we make music is an honor and a gift. Fun tunes, Would love to go! I live so close to the goodfoot…This would be an awesome show!